Websites and blogs that I have designed and built. A new website that I developed for my friends Rene and Adrian at R&A Fuller Hair World. I built their original site (in hand-crafted PHP and HTML), which served them faithfully for over 10 years! I am very pleased and honoured that they asked me, once again, to create an exciting and dynamic web presence for them. Dysis Care is a consultancy specialising in the assessment of those living with dementia and their communications needs. 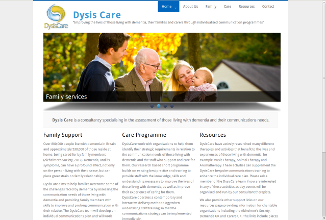 Check it out the new site I built for them at: http://www.dysiscare.com It is built using everyone's favourite CMS, Drupal 7. The front page features an image reel, which is linked to relevant pages, a triptych content area, and across-the-page Twitter feed. Feel free to contact me if you'd like me to build you something similar. 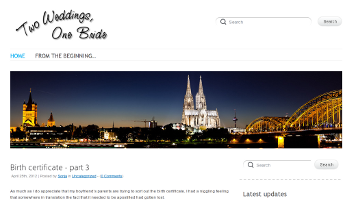 I've just set up a blog for my girlfriend: Two Weddings, One Bride, using WordPress. It's my first experience of WP, and I must say I'm impressed. If you're setting up a site specifically for blogging, you could do a lot worse. I've used the "Delicate" theme, by NattyWP, with a few tweaks.. 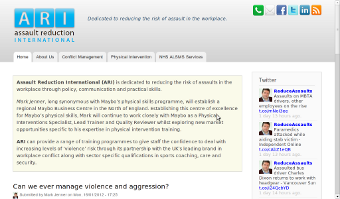 I recently built this website for a mate who runs a company called Assault Reduction International. Check it out at: http://www.assaultreduction.com It is built using Drupal 7 with the emphasis on a clean, uncluttered look. Feel free to contact me if you'd like me to build you something similar. 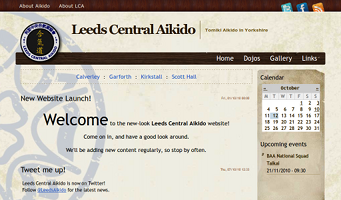 I recently built a new website for my aikido club - Leeds Central Aikido. Of course it's still a work in progress, but I'm quite pleased with how it turned out. Contact me and let me know what you think, or if you'd like to hire me to build your next site.